What ISIS has done in Iraq, Boko Haram is doing in Nigeria, a Nigerian cleric says. ”The news is really bad. When they attacked our hometown, we decided to vacate the place. In Michika and surrounding areas, soldiers were running away. Some of them were killed or wounded and lot of people were also running for their lives,” Rev. 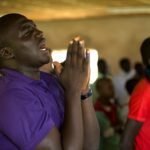 Samuel Dali, President of the Church of the Brethren in Nigeria, told World Watch Monitor as he was on the run, a few metres from the Cameroon border. During the weekend of Sept. 6-7, Boko Haram militants took over Dali’s hometown of Michika, in Adamawa State, on Nigeria’s eastern border. Recent territorial gains made by Boko Haram in the northeast, he said, signal the end of his home and of the church in that part of the country, Africa’s most populous. In Iraq, The Islamic State of Iraq and Syria, or ISIS, swept across the country’s north in June, forcing hundreds of thousands of people, about a quarter of them Christian, fleeing from their homes. Hundreds have been killed. Whole towns have essentially emptied of Christians and non-Sunni Muslims, and their places of worship have been destroyed or occupied. The situation in the parts of northeast Nigeria overrun by Boko Haram is similar, Dali said. ”We have lost almost everything,” he said. “Most of our churches have been destroyed and our pastors are scattered all over. Our members have fled and some of them killed. That’s what we have tried to prevent from happening.” The Church of the Brethren is known locally as Ekklesiyar Yan’uwa a Nigeria, or EYN Church. And, as in Iraq, Nigerian Christians are on the run, Dali said. During the weekend attacks, dozens of cars loaded with people and luggage formed a long queue. Many, he said, were confused, and didn’t know where to go. Some are thinking of crossing the border to Cameroon, while others planned to reach relatives and friends elsewhere in Nigeria. In recent weeks, thousands have already crossed the border as the insurgents have overrun several major towns, notably Bama, the second-largest city of Borno State with about 270,000 inhabitants and just 45 miles away of Maiduguri, the state capital. Despite government assurance that Maiduguri is safe, traditional elders — a forum made up of retired civilian and military officials — have told Nigerian news media that Boko Haram has surrounded the capital, where thousands of people have been taking refuge. 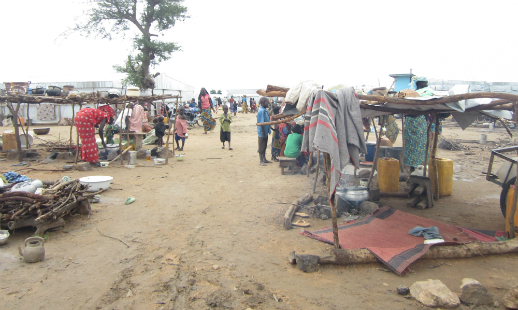 They called on the government to send reinforcements and also warned that the people in Maiduguri are facing starvation, given that subsistence farming has been disrupted by the continuing violence. With the black-and-white jihadists’ flag flying over Michika and Bazza, attention now is turned to nearby Mubi, the commercial centre of Adamawa state, which had a population of about 60,000, though now is largely deserted, according to the BBC. The Nigerian government declared a state of emergency in Adamawa and two other northeastern states, Borno and Yobe, in May 2013, and extended it, for a third time, in May this year. The military has deployed an additional 500 troops to help take back Michika and two other towns, Gulak and Kunchinka. Dali said it’s too late. Pogu said Boko Haram’s offensive is meant, in part, to deny President Goodluck Jonathan, a Christian, a second term after Nigeria’s 2015 elections. Widespread but vague suspicions of well-placed Boko Haram patrons broke into wide-open national debate in late August when Stephen Davis, an Australian who in April was authorized to negotiate the release of the Chibok girls, provided names of government officials that he said provide money and supplies to the militants. Davis claimed that the former Governor of Borno State, Modu Sheriff, and a former Chief of Army staff, retired Gen. Azubuike Ihejirika, are among the top sponsors of the Islamist insurgents. Both Sheriff and Iherjirika deny the allegations, which themselves have been swept into Nigerian politics.